New Year’s might be the traditional time to make resolutions, but at Mindprint we believe the summer solstice can mark the best opportunity to make important lifestyle changes. Summer affords plenty of time to persevere and make sure that those new habits stick without the competing demands and stress of a rigorous academic schedule. We’ve picked our favorites that should be relatively easy to keep once you get started and can truly benefit the whole family. 1) Get Enough Sleep. According to the National Institutes of Health, school-aged children should be getting 10 hours of sleep a night. A good night’s sleep improves emotional and physical health and enhances learning and retention. During the school year, 10 hours might seem impractical, but during the summer it should be manageable. Encourage your kiddo to go to sleep a little bit earlier or sleep a little bit later each day until they get close to the goal. Take note of how much better they feel and then come up with a plan to achieve the sleep goal during the school year. 2) Weekly Clean-Up. Good organization enables us to complete work more efficiently and avoid misplaced assignments and missed deadlines. The result is better grades and less stress. Start the summer with a good old-fashioned bedroom clean-up, including a well-organized homework space. Once the room is clean, agree to a manageable 15-30 minutes weekly clean-up to maintain it. Keep to the schedule during the school year. And be sure not to forget the backpack, the Bermuda Triangle of homework, teacher notes, and gym socks. 3) Family Dinners. The benefits of family dinners are real. Better relationships, communication skills, and nutrition. 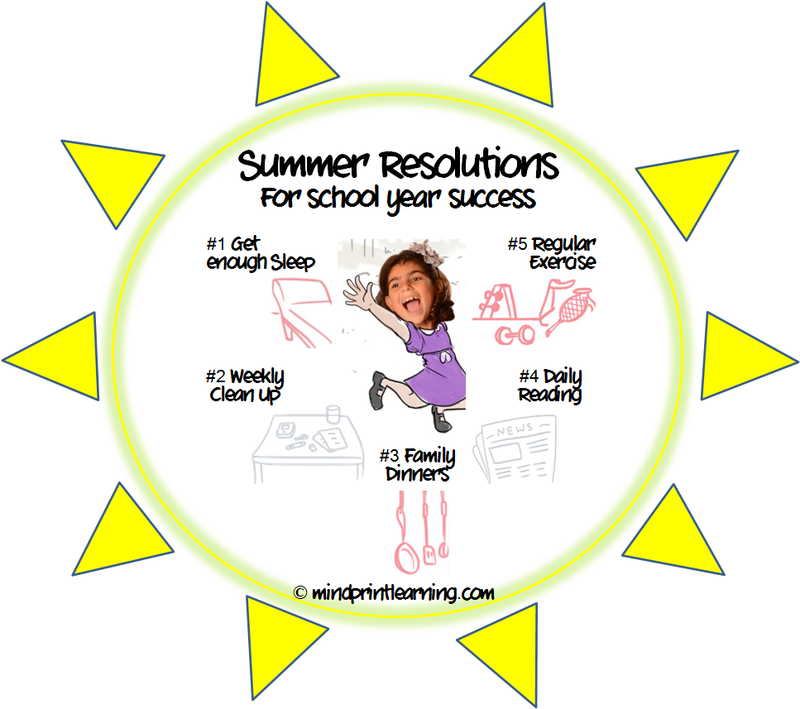 Crazy school year schedules often interfere, but summer should allow for greater opportunity. Plan for weekly favorites that everyone will look forward to. And to the extent there’s interest, cooking is a great way to build flexible thinking, math and organization skills. 4) Daily Reading. The relationship between independent reading and academic success is well-documented. If your child no longer reads for pleasure, set aside family reading time. Everyone sit down and read for 30 minutes. Or consider reading aloud (yes, even for high school students) or enjoy an audio book together on a long car ride. Ideally this will develop interests and have your child re-discover the joy of reading. Here are suggestions to engage a reluctant reader. 5) Regular Exercise. At least 20 minutes 3 times per week is a rule of thumb. If your child isn’t already doing this, use the summer to try out different types of exercise your child might enjoy. The good news is that exercise can be addictive, so once your child builds up to a regular exercise routine it will be much easier to keep up the momentum during the school year. Did these strategies work for you? Let us know by leaving a user review on the Mindprint website. Read more about these topics and many more in our carefully curated collection of articles. We hope your summer is off to a wonderful beginning. Be sure to check out Mindprint for plenty of great summer activities.